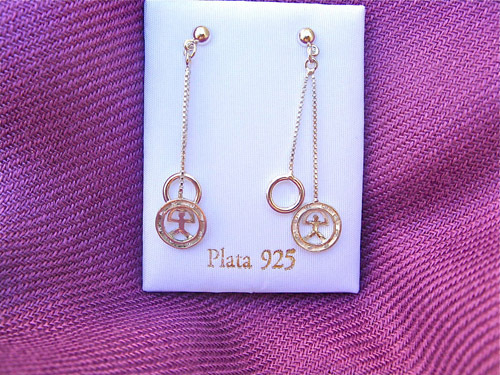 These rare and beautiful sterling-silver chain earrings feature the lucky Indalo from Andalucía, Spain, where even today, small village pueblos lie hidden behind the giant sierras that roll down to the Mediterranean shores and the Indalo is recognised as a symbol of protection and good fortune. Inspire your friends or loved-ones to be lucky and positive by sending them this meaningful present. It is the ideal gift for a woman / lady / girl to show her you are thinking of her and that you really care. Description: The earrings measure 44mms in length. The little Indalo is framed in a pretty decorative circle hanging on a delicate sterling silver chain with a second chain supporting a circle. The earrings have a post and butterfly to attach. Unique and so pretty. Everyone needs a guiding spirit to help them through some of life's challenges. Perhaps these little lucky Indalos can help. Come gift-wrapped, like all our presents (with an information card about the Indalo) - and we can print a personal message on your behalf.